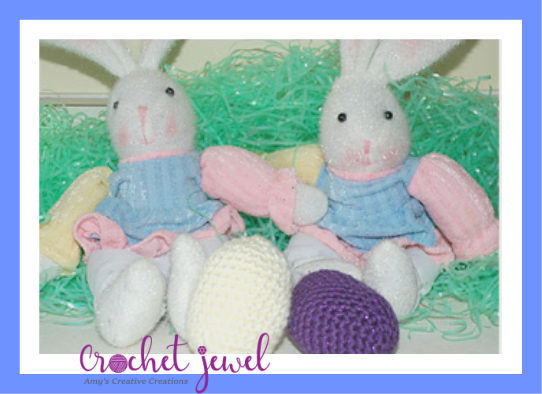 Enjoy these cute Crochet Easter Egg Pattern! Cute to add to an Easter Basket! Start: Rnd 1: Chain 2, Work 5 sc in 2nd chain from the hook, sl st.—5 sc. Round 3: *Sc in next sc, 2 sc in next sc around, *Repeat—15 sc. Round 4: *Sc in next 2 sc, 2 sc in next sc, *Repeat around—20 sc. Round 5: *Sc in next 3 sc, 2 sc in next sc, *Repeat around -25 sc. Rounds 6 and 7: Sc in each sc around. *Repeat around twice. -25 sc. Round 8: *2 sc in next sc, sc in next 12 sc, *Repeat twice, -28 sc. Rounds 9–12: *Sc in each sc around, *Repeat around 4 times -28 sc. Round 13: *Sc2tog, sc in next 12 sc, *Repeat twice—26 sts. Round 14: *Sc2tog, sc in next 4 sc , *Repeat 4 times—20 sts. Round 16: *Sc2tog, sc in next 2 sc, 4 times—12 sts. Round 17: Sc3tog decrease 7 times. Fasten off and Weave in the ends.